There are two different types of Hammertoe. Flexible Hammer Toes. These hammer toes are less serious because they can be diagnosed and treated while still in the developmental stage. They are called flexible hammer toes because they are still moveable at the joint. Rigid Hammer Toes. This variety is more developed and more serious than the flexible condition. Rigid hammer toes can be seen in patients with severe arthritis, for example, or in patients who wait too long to seek professional treatment. The tendons in a rigid hammer toe have become tight, and the joint misaligned and immobile, making surgery the usual course of treatment. The most common cause of hammertoe is a muscle/tendon imbalance. This imbalance, which leads to a bending of the toe, results from mechanical (structural) changes in the foot that occur over time in some people. Hammertoes may be aggravated by shoes that don?t fit properly. A hammertoe may result if a toe is too long and is forced into a cramped position when a tight shoe is worn. Occasionally, hammertoe is the result of an earlier trauma to the toe. In some people, hammertoes are inherited. Putting padding between your toes and strapping them in place can help to stop pain caused by the toes rubbing. Custom-made insoles for your shoes will help to take the pressure off any painful areas. Special shoes that are wider and deeper than normal can stop your toes rubbing. However if your pain persists your consultant may recommend an surgery. 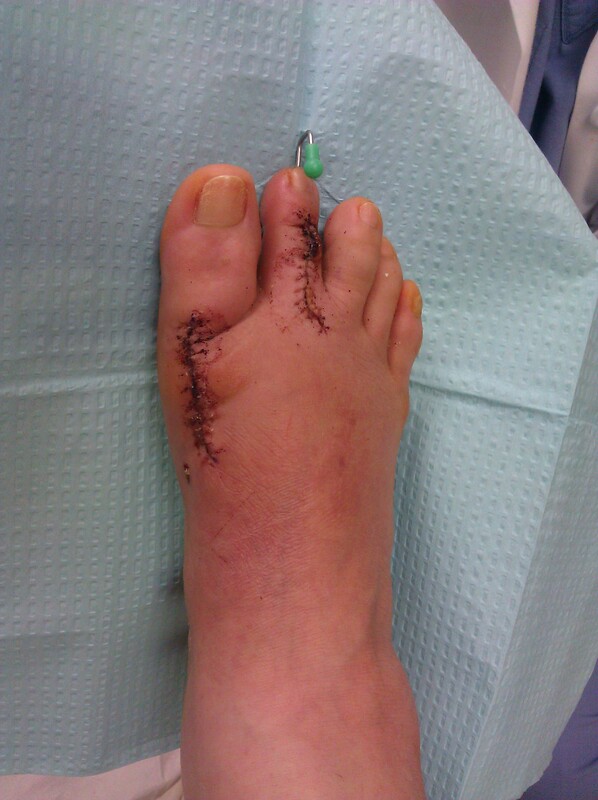 Ordinary hammertoe procedures often use exposed wires which extend outside the end of toes for 4-6 weeks. Common problems associated with wires include infection where the wires come out of the toe, breakage, pain from hitting the wire, and lack of rotational stability causing the toe to look crooked. In addition, wires require a second in-office procedure to remove them, which can cause a lot of anxiety for many patients. Once inserted, implants remain within the bone, correcting the pain and deformity of hammertoes while eliminating many of the complications specific traditional treatments. Hammertoes usually start out as mild deformities and get progressively worse over time. In the earlier stages, hammertoes are flexible and the symptoms can often be managed with changes in shoe styles and foot care products. But if left untreated, hammertoes can become more rigid and painful. Corns are more likely to develop as time goes on-and corns never really go away, even after trimming. In more severe cases of Hammertoes, corn lesions may evolve into severe ulcerations. These lesions frequently occur in patients who have vascular disease or are Diabetic with neuropathy. The ulcerations can extend to the bone and result in infection and possible loss of digit or amputation. In some cases, usually when the hammertoe has become more rigid and painful, or when an open sore has developed, surgery is needed. Often patients with hammertoe have bunions or other foot deformities corrected at the same time. In selecting the procedure or combination of procedures for your particular case, the foot and ankle surgeon will take into consideration the extent of your deformity, the number of toes involved, your age, your activity level, and other factors. The length of the recovery period will vary, depending on the procedure or procedures performed.